The tillers, the farm is so useful that it is sometimes difficult to imagine at once. 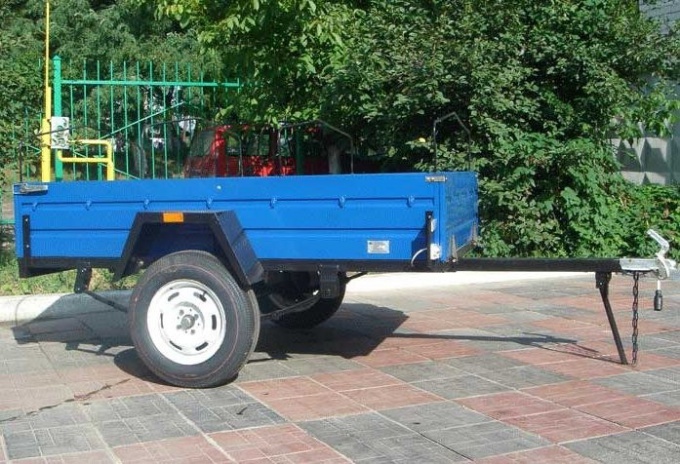 For example, if you make a trailer for walking tractor, it can be used to carry quite large loads over long distances. - screwdriver and other tools. Make the frame of the trailer, combined with the frame bars of the body. Of tubes of rectangular cross section 60x30 mm cut two spar, and steel square tubes 25x25 mm or two yokes (front and rear crossmember). Weld them together and secure with five cross members to form the grille of the platform. Note: yoke and cross member relative to the side members to form small editions. To the ends of the releases on the sides of the frame longitudinal weld of the pipe, which, in turn, set on four stakes. To the racks weld the top cord of the same square pipe 25x25 mm. Front and rear side, make the flip, to be able to transport on the trailer, walking tractor long loads. For this frame, run separately from the frame. Close the grill platform duralumin sheet thickness of 2 mm, secure it using the M5 bolts with countersunk heads. For sides you can use a thin sheet, for example, 0.8 mm. Trim the sides of the weld to the uprights and strapping point. The axle beam weld of two identical segments of channels No. 5 by inserting them one into another. At the end of one of them fasten the two wheel axles. The gaps between the channels and the axle, close the plates cut from sheet steel. Springs and wheels for trailer take from the car "Moskvich-412" with the help of springs connect the beam with the frame rails. In Central weld them to the beam with step-ladders, and the ends attach to the spars, wearing one of them on the axis of earrings, and one on the axle bracket. Two pole run of pipe cross-section 60x30 mm, and the rear ends weld to the front ends of the side walls overlap at least 200 mm. the Front ends of the beams and weld the wire to the chassis of the towing device. If possible, install on a homemade trailer for motoblock brakes, alarm systems – Parking lights, turn signals, brake lights to make the road safer.